Why a KTM 495 Site? I bought a KTM 495 in March 2000. It looked in good shape and did go - but it had a few problems... So I decided to find out a bit more about the 495 and get some parts for it. Finding parts has been OK but finding info has proved a problem - the 495 pre-dates the Internet by a few years and there's not much to be had. Ok, Why then a KTM 500 Site too? My KTM 500MX is a brute, evil, hard, heavy beast without pardon. I bought it cheap in pretty bad condition. When investigating the whole thing I found out that mechanically It was rather ok actually. New clutch plates, some wires and bearings for the chassi looked to be what it needed. The plastic was a sad story but I have managed to buy those at reasonable prices. I have ridden it several times and the most significant thing is the way it breaks down your forearms. Another rather scary thing is the brute power. I havn't had a chance to make a head to head comparison with the 495 but I think both has more than enough. The water cooled 500 doesn't have the vintage value of a 495 but it sure has attitude and personality. I love it! Q: What's the fastest dirt bike ever made? 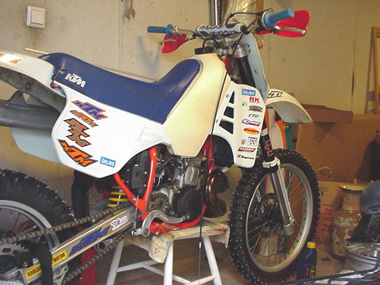 A: The fastest real dirt bike ever was the KTM 495. When I was editor of Dirt Bike, we geared one to the moon and had Rod Bush do 123.75 miles per hour on El Mirage Dry Lake with that particular bike. I believe the year was 1981. I have not heard of any other true stock dirt bike go faster under verifiable conditions. 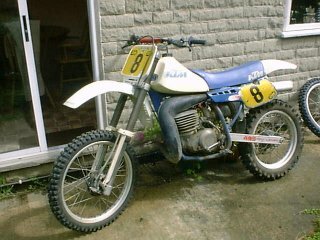 I believe that it would be very hard to have a 500-650cc four stroke dirtbike going as fast as a healthy KTM 495 from the early 80's.